The Democratic Republic of Congo (DRC) could be one of the richest countries worldwide, as for its subterranean resources. It is but one of the poorest due to exploitation, corruption, never-ending wars, as well as endemic gender-based violence. In the aftermath of the 90s conflict, which protracted formally until 2003 but hasn’t yet entirely ended, if agriculture yielded less and less fruits and men got engaged in the battlefields more than in the harvest, the closure of national mining companies led to the sudden unemployment of a huge share of the male population. 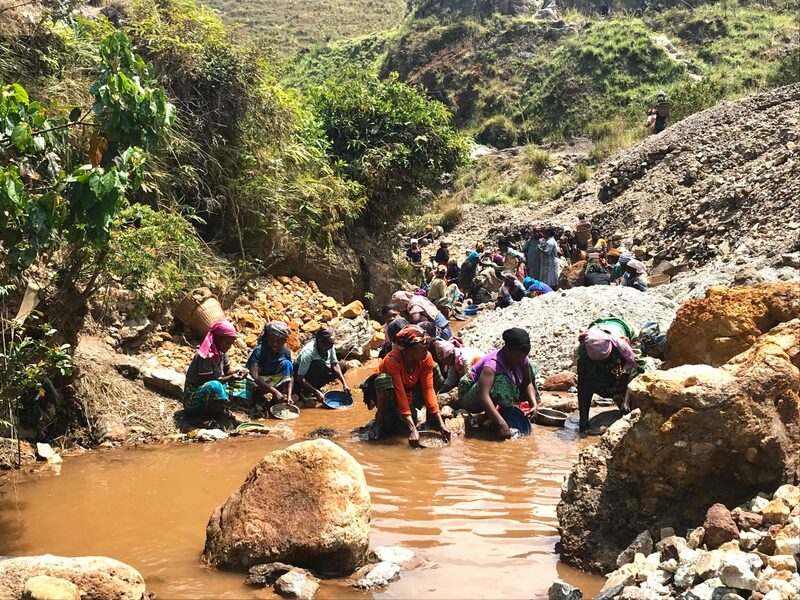 It was then that Women started rolling up their sleeves and engaging more and more in small-scale or artisanal mining (AMS), such as the only sector that could grant unskilled, illiterate and discriminated labourers like them quick cash to fulfil their families’ daily needs. In early 2006, as the government started to slowly strip the mineral extraction off the hands of the dozen rebel groups operating throughout the East, and regulate the work in the artisanal mining sites through the establishment of licenced cooperatives, the gender issue, which had been disregarded until that point, became more relevant. In fact, if, on the one hand, the authorities were making some efforts to clean up the image of a well-known dirty business, on the other hand, the ever-larger number of women that kept entering the AMS didn’t have any legal, technical and financial means, to protect themselves within their working place. Naturally, women miners started gathering around women-only mining associations, to both demand better working conditions for themselves and to raise awareness on their often-neglected rights. With the passing of time, these organizations grew in number and today most of them are grouped around a vast national women’s network. If the associations still dispose of limited financial means to create a real change amongst individuals that have been oppressed for centuries, thanks to this net, women overcame their geographical isolation, as well as started experiencing economic benefits and, as a result, are now slowly climbing the social ladder.